Heads up BMW provided the parts! Like many others had an advisory on corroded Petrol Tank support bracket and strap. Ordered all the parts, the strap and pads arrived and was advised that the the support bracket was not available and the order had been cancelled by BMW. 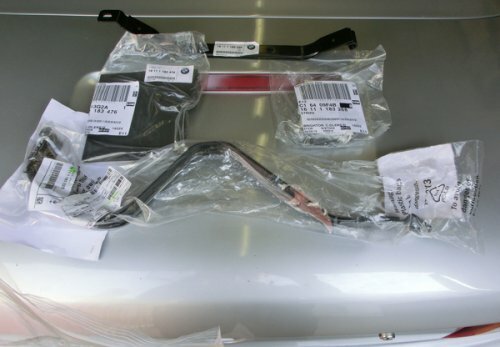 Persuaded the BMW agent to reorder the support bracket by itself and see what happened, it arrived on Friday! Now to get them fitted! I also got an advisory a couple of MOT's ago but luckily it didn't get mentioned at the last one ... however think it's just a matter of time! So any guidance would be gratefully received as I've read somewhere that you need to drop the fuel tank to replace the strap ... hope not! Ditto that... I'd hate to have to dismantle the entire rear end sub frame/ suspension etc etc.... Be interested in the procedure..
Its difficult to see the support and straps when the car is up on axle stands so I had not been able to get a good look at them. Had a chat with a friendly BMW agent and managed to get the Z3 up on a lift to get a good look at the support and strap to assess their condition. The guys at the agent became interested so it ended up with myself, their MOT tester and and an engineer with experience of Z3's under the car. The Support and strap do have corrosion and will need replacing. The question is when, they may be good enough to last for another MOT test. Depends if they deteriorate between now and the next MOT. As they got interested in the car we had a good look at everything else. As it has always been kept in a garage and has only done 61K miles every thing else is in good condition. Working out how to replace them, it looks like it is difficult, there is not enough room to get them out! The rear subframe and axle needs to come out to give access to remove and replace the support and strap. It's going to be a struggle to get the axle out on the driveway, a friend has a pit in his garage but that looks like it would still be a struggle. so I may have to bite the bullet and get the agent to do the job, they quote 4 hours which I think is quite short. This thread on .org is worth a read. Seems like new ones aren`t available. Mazza was looking at fabricating a 2 piece strap in stainless so you don`t have to drop everything. Not sure where he`s up to onthis one. To replace the support bracket and strap you need a lift to get easy access to the tank and the rear axle has to come out. Had the BMW Dealer change the support bracket and strap, it took them 2 1/2 hours to do the work.